The king and queen hold hands and she holds a rose, and he his sword. Their love is shown in the (heart shapped) space between them. They are fully three-dimensional sculptures made to be seen from all sides. From the back you can see the beautiful dragon design on his cape and the purse that hangs from her waist. (On your cake the base will be partly-covered by frosting or flowers. 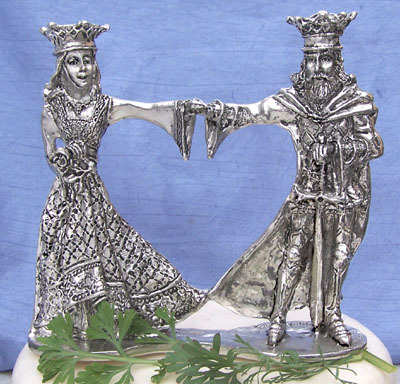 )We make them by hand from lead-free pewter, and they are 5 1/4 inches tall.